Any run that ends with cake, a brass band, and beer, has to be worth entering. As I limped back up the lane, in the company of another runner who revealed herself to be the Assistant Race Director, I remarked on this. In retrospect, the difficulties diminish in importance. After a run of dry sunny days, Sunday began with rain, heavy at times, and the course was difficult. I ran the race last in 2009, when the sandy soil around Bewl Water was dry and dusty, so that runners ahead raised clouds like the posse in a Western. This was rather different. An innovation is the use of chip timing, less important to slowcoaches like me who use calendars rather than watches to log the duration of our runs, but definitely useful for the fast ones, at a race with a crowded start like Bewl. Led by a piper, we walked down to the start. I sheltered under some trees, until it was time, and we lined up for the start, filling the narrow lane. No sooner had we started than the scale of the problem became clear. The sandy surface had become, with the persistent rain, treacherous. We slid our way through the first few miles. 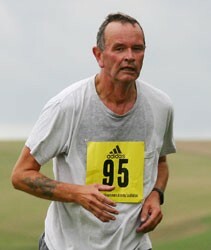 indeed a witty fellow runner asked me if my vest should not read Seaford Sliders, rather then Seaford Striders. We pressed on. The rain stopped at around five miles, and we could enjoy the views, as we went into woods and out again in clearings on the banks of Bewl Water. I saw grebes and heard fish jumping. At around mile ten, the route heads inland, for a gruelling series of hills. By now I was being passed by thin runners, fat runners, men, women, younger and older than me. As we neared the final miles, other runners had the benefit of coaches who came to encourage them on. Their encouragement was not always well received. I pressed on, painfully slow, but still running. I’d rather run slowly than walk. I had decided to enter this race back in January; it was to be my longest race of the year. I finished. The marshals and supporters were splendid. I shall return. 01:37:20 Simon Fletcher, 01:51:03 Scott Hitchcock, 01:56:40 Phil Robinson, 02:12:16 Claire Keith, 02:23:45 Alan Hards. And I finished in 03:19:51.